You know what your kids think of you by what their friends say about you. Some months ago, a friend of Drama Girl's looked at me quite innocently and said "where do you keep all your plates with dead people on them?" Sadly, she is correct. I do have an extensive collection of Staffordshire plates , most of which are souvenirs or commemorative. Sometimes we even eat off them. This one is possibly my favorite. It's Charles Dickens, and he gazes at me every day from his place of honor - in my bathroom. OK, it's a blue bathroom, and he fits in with the decor. But yeah, maybe it's a little weird. I'm a huge fan of Dickens, and this plate includes scenes such as "the Old Curiosity Shop" and "Dotheboys Hall," which is from my favorite novel, Nicholas Nickelby. The level of detail in the pictures is fabulous. Transferware like this has been produced for more than 100 years, although this plate isn't that old. The process involves a copper plate to transfer the ink to tissue which transfers it to china. A lot of transferware was shipped to America, and today you can find pieces on eBay in a variety of colors. Blue is probably the most common. I collect primarily pink transferware, which is a little harder to find. I bid and lost out on this one on eBay so many times I lost count. I guess I'm not the only Dickens-on-a-plate fan. But I'm probably the only one who put him in my bathroom. 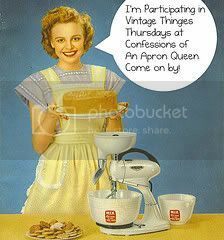 For more wonderful vintage show-and-tell, visit Confessions of an Apron Queen every Thursday. That is one of the best VTT's ever! I adore blue and white china and Dickens too, so I am positively gobsmacked with delight at the sight of this. Wherever did you find this? Bleak House is my favorite Dickens novel but I love a lot of them. What's your favorite one? I was folding towels too. Terrific plate! I love those blue ones with the people on them too. But I will just have to enjoy your collection because I don't have any. Hope you are continuing to enjoy this Most Wonderful Time of the year. 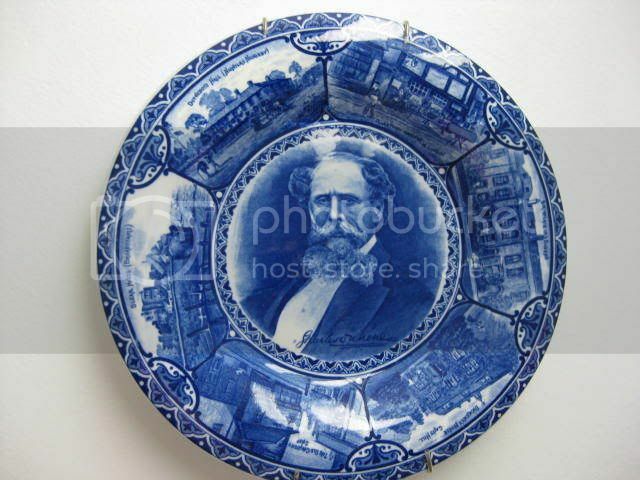 Oh wow, what a neat plate....Bathroom...I don't know if I could take the watchful eye of Dickens in the bathroom! LOL. I do love the color blue, I have actually never seen any plates like that. I will have to keep my eye out for some. Gotta love Dickens...I've spent a good deal of time with him this summer! What a nice plate. Very unusual. I love that you keep it in your bathroom. Now, please show us some of the pink ones. Charles Dickens looks at you when you pee???!!! I'm sorry. That made me laugh. But, it is a beautiful plate. I love that he's in the bathroom...I bet guests just crack up. Okay, go to LP now. Someone just announced they are expecting! Oh, would you be interested in blue plates that look like transfer ware but have ships of all kinds on them? That plate is beautiful! I love it- although not a fan of Dickens. Is it me or does the man write the world's longest sentences?